Find your data heroes/stewards and work with them to build and communicate relevant, clear data policies. Don’t underestimate the time required to get a data management and governance initiative in place. While the goal is to have the entire enterprise adhering to the same data policies, start small. Pick one example and prove it out. People are much quicker to participate when they know there are benefits to enjoy. And don’t stop there, continue to communicate successes and metrics as you expand your data governance initiative. As you mature your governance processes, you will continue to discover and evaluate data and data sources. You may need to add to or even modify an existing policy. Change is imminent; periodically review and evaluate your existing policies to see if any updates are necessary. Be sure to communicate any changes to the rest of the organization. In thinking about the word “persistence”, consider two things – 1. be prepared for a fight and 2. this could take a long time. 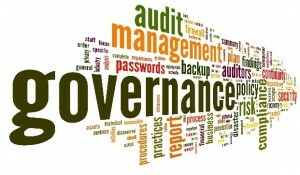 Both are possible and even probable with instituting data governance. As Bill Watterson points out is this Calvin & Hobbes comic strip1 about persistence, you have to keep pursuing your objectives. Have not only an established mitigation path but secure executive sponsorship and support. Both will speed up any disagreement resolutions or lack of participation from some within the organization. It’s never a good idea to have a developer be the only one testing what they created. Many developers test what they know but may miss areas of concern for other functional users. Anticipate things a developer may miss because it’s what we don’t know that gets us in trouble. It is also important to have a qualified outside firm test your security defenses not only to ensure tests are completed by a neutral party, but also, to challenge your system by someone who does nothing else but exploit computer systems and knows a variety of ways for attacking your system. Data management and governance may seem like an impossible dream – not so… On the other hand, never think it’s fast and easy, because it’s not. The key takeaway message is that it’s worth the effort. Good, telling, informative and actionable analysis cannot begin to exist without quality data. And that is a lesson worth learning! Once you have good control of your data, use it to drive continuous improvements throughout your entire organization. Here’s an example of how one company delivered superior results once they took control of their planning data and created Clean Orders.